Walker & Dunlop, Inc. (NYSE: WD) (the “Company”) announced today that it structured a $21,750,000 loan for Lion’s Ridge Apartment Homes (“Lion’s Ridge”) at the foot of Vail Ski Resort in Vail, Colorado. The 114-unit multifamily property provides much-needed, quality workforce housing, which is in significant demand in this high-cost market. Justin Nelson, Milwaukee-based senior vice president, led the Walker & Dunlop team in arranging the Fannie Mae refinance loan for Gorman & Company, Inc. (the “Borrower”), one of the largest and most respected multifamily development firms in the United States. Lion’s Ridge utilizes a ground lease structure and is owned by a public/private partnership between the Borrower and the Town of Vail (the “Town”). Completed in 2016, the new development replaces a portion of Timber Ridge, originally a 102-unit apartment community in disrepair that was purchased by the Town when its 20-year deed restriction for affordable housing neared expiration. The Town immediately made improvements to the property, then split it into two parcels, allowing for one side of the site to be redeveloped into Lion’s Ridge. The other side of the site is still host to a legacy Timber Ridge building that is operational and open to residents. Lion’s Ridge now consists of four three-story buildings with one- and two-bedroom units. 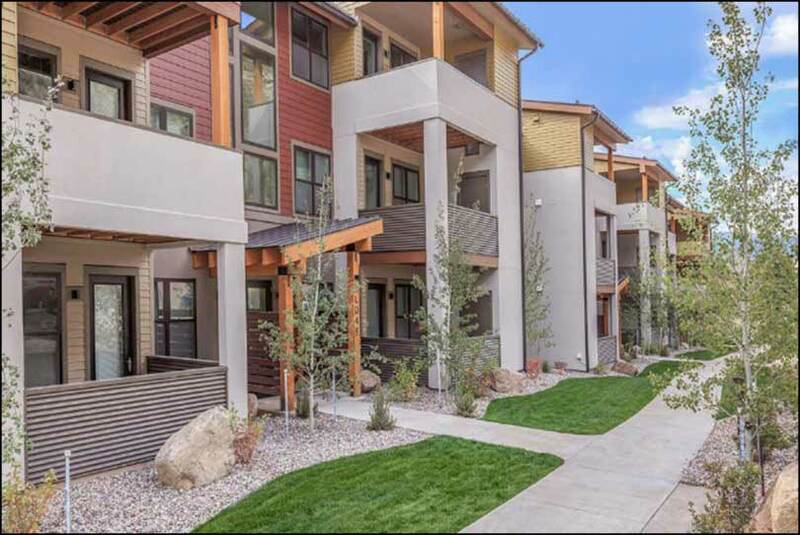 Each of the 30 one-bedroom units qualifies under the 90 percent AMI rent limits of Eagle County and are available exclusively to residents who work at least 30 hours per week within the area. The unique transaction was structured with an atypical eight-year, fixed-rate term. Loan details also include customized prepayment flexibility, allowing the Borrower to exercise an option to purchase the ground lease from the Town. Situated on 5.2 acres of land just off Interstate 70, the property is centrally located in Vail. Local amenities include the adjacent post office, grocery options such as City Market and Safeway, several restaurants and coffee shops, a child care center, and a Holiday Inn. The newly-constructed property features luxury finishes and amenities, including large windows, mountain views in all directions, nine-foot ceilings, private balconies and patios, individual heating, and in-unit washers and dryers. Residents also enjoy a park and play area and convenient access to the local walking and biking trail. Lion’s Ridge is just one example of Walker & Dunlop’s dedication to providing much-needed affordable housing options to renters throughout the nation. The Company’s originations within the affordable asset class is growing rapidly; in the first half of 2017 Walker & Dunlop originated over $1 billion in transactions on affordable properties, almost double the amount of its 2016 full-year affordable loan volume of $622 million. For more information on the Company’s offerings, please browse our full suite of capabilities.